The 503km Trans-Ecuadorian System Oil Pipeline (SOTE), which connects oilfields in the Ecuadorian Amazone basin with the Pacific coast and cuts through highly valuable cloud forests of the Andes, has been a matter of major environmental disputes in the country. An oil spill caused by a landslide in 2013 and polluted the Coca and Napo rivers illustrated the kind of threats. It will be in the future a matter of wise political decisions for Ecuador how the country will combine its further development of oil resources with preserving its pristine and highly diverse natural habitats and increasing its protected areas and nature-based tourism. economy. The decision in 2013 to abandon a plan to spare the species-rich Yasuní rain forest in eastern Ecuador from oil development points so far to a wrong direction. 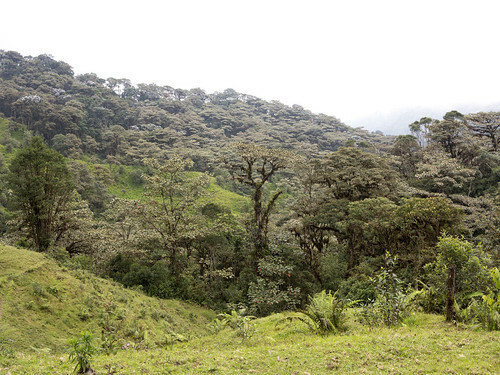 Cloud Forests are more lush and cooler than lowland Rainforests. Another difference is that Rainforests have larger, silt laden, slow moving rivers, while Cloud Forests are characterized by fast moving, clear rocky rivers. Cloud forests have beautiful overlooks due to the irregular, mountainous terrain. This is important in the distribution of species. Cloud Forests, because of natural barriers, have many range restricted or endemic species, e.g. many tree species and epiphytes, such as Orchids.